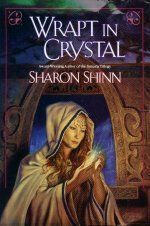 Sharon Shinn's previous novels include The Shapechanger's Wife, Archangel and Jovah's Angel. She is a 1996 John W. Campbell Award nominee, and winner of the 1996 IAFA Fantasy Award. Some books simply defy easy categorization into a genre. This group definitely includes Sharon Shinn's latest effort, Wrapt in Crystal. Set in the future on a distant planet, it is, at heart, a murder mystery. As much as anything else, however, the book is a vehicle for Shinn to explore various religious concepts -- something she does very well. The protagonist is Cowen Drake, an agent for the Intergalactic Alliance of Federated Planets (which is a misnomer, as "Interfed" is limited to only our galaxy, and thus isn't inter-galactic at all). He is sent to Semay, a planet not part of Interfed, to help them investigate a series of murders of priestesses. Interfed hopes that solving the murders will help convince Semay to join the federation, so Drake is under immediate pressure. All of Semay worships a goddess named Ava, but there are two radically different sects. The priestesses of the Triumphantes have great wealth and political power, and celebrate joy and beauty. The Fideles live in poverty, spending long hours ministering to the planet's sick, poor, and downtrodden. The two are so different that no one can understand what would motivate a killer to target both sects. Each sect assigns Drake a priestess liaison to help him with his investigation. Throughout the course of the investigation, Drake becomes very close to both of these women. Through his dealings with them, he has many discussions about religion, philosophy, and life. These explorations are very thought provoking, and are probably the most interesting aspect of the book. I am not usually a fan of mysteries, but still found the mystery component of Wrapt in Crystal gripping. At the same time that Drake is gathering clues, many other interesting things are going on. This made the whole story much more compelling for me. I only had one criticism on Shinn's work, and it is a minor one. The dialogue between the characters often seems somewhat flat or stilted. I frequently found myself thinking that no one would ever actually talk that way. However, given that much of the conversation borders on the dialectical, this may have been hard to avoid. The combination of story elements in the book make for a very unusual and attractive story. Wrapt in Crystal has something to interest almost any reader. James Seidman is a busy technology manager at a Fortune 100 company, who needs the excuse of doing book reviews to give himself time to read. He lives with his wife, daughter, two dogs, and 35 fish in Naperville, Illinois.